Ohio lawmakers overturned two vetoes from Republican Gov. John Kasich on guns and public official pay raises. The legislature failed to overturn a veto on a bill that would create stricter abortion laws. One measure, which will become law, will shift the burden of proof standard for cases in which a defendant claims self-defense after using deadly force. Previously, Ohio law would have required the defendant to provide a preponderance of evidence that demonstrated that he or she was being threatened. Now, the law will use an innocent-until-proven-guilty standard and require that prosecutors prove beyond a reasonable doubt that the person was not defending themselves against a threat. To appease critics, the legislation was to take out language similar to stand-your-ground laws in other states. That language would have made it legal to use lethal force for self defense purposes without first being required to retreat. Additionally, the House and the Senate successfully overrode Kasich’s veto on pay raises for public officials. The new law will increase the base pay for state lawmakers by $13,000 over the course of nine years, from $60,584 to $73,167. There will be additional raises for members of leadership. Along with raising their own salaries, lawmakers also increased salaries for other local officials, including judges, sheriffs, prosecutors, county commissioners and members of boards of elections. 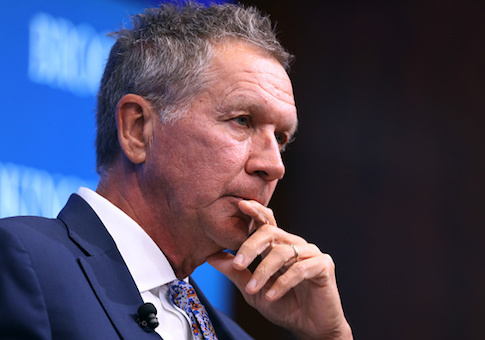 The legislature unsuccessfully tried to overturn Kasich’s veto of the "heartbeat bill," which was an anti-abortion measure that would have prohibited an abortion after the detection of a fetal heartbeat. A heartbeat is usually detected around five-and-a-half to six-and-a-half weeks. Although the override of Kasich’s veto was successful in the House, it fell one vote short of the supermajority needed in the Senate. Senate President Larry Obhof, R-Montville, told reporters that both legislative chambers will have a pro-life supermajority sworn in next month and the legislation could return. "I think that the celebration for some of the people in here will be short-lived," Obhof said, according to the Associated Press. "We will have a supermajority that is pro-life in both chambers in the next General Assembly – we're getting sworn in in less than two weeks, and we have a governor coming in who has said he would sign that bill." This entry was posted in Issues and tagged John Kasich. Bookmark the permalink.